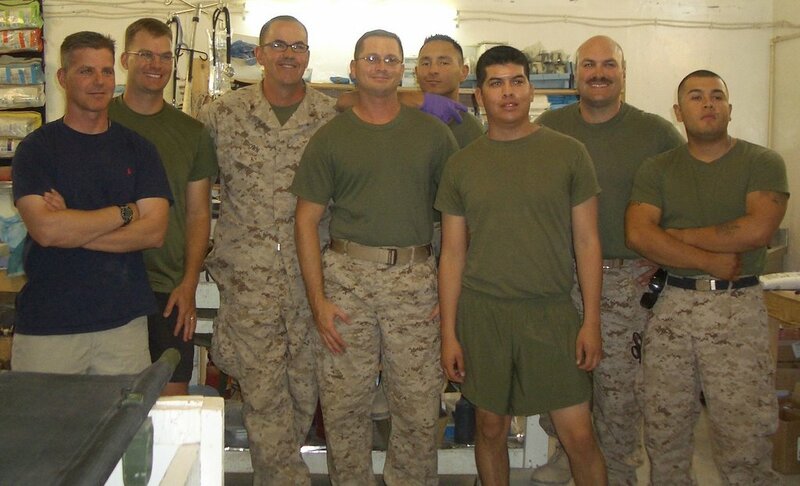 Here is the surgical team deployed with me to Ramadi. From left to right: LCDR Christian Clark (orthopedic surgeon), LCDR Dave Junker (anesthesiologist), yours truly, LTJG Richard White (2nd tour, previously a Navy corpsman and now a physician assistant), HM3 Tony Rogero (2nd tour, Navy corpsman and previous Purple Heart recipient), HM3 Hugo Loera (Navy Corpsman and surgical tech), LT James Nowell (ICU nurse back home, but ER/OR/ICU and evacuation nurse in Iraq), HM3 David Leyva (Navy Corpsman and surgical tech). All have left friends family back home to come provide medical care for the casualties of this conflict and I look forward to proudly serving with each of them. We have had just a few scattered casualties so far, but nothing serious and nothing requiring surgery. The booming artillery fire leaving our base takes some getting used to, but I feel much better knowing most of it is outgoing and not incoming. Take care. Excellent getting to know the team, fellas. You have many fans back home. Looks good honey, What did HM3 Rogero get his purple heart for. Glad that they are with you. Hang in there and have fun. HM3 Rogero earned his Purple Heart when he was injured while storming a house in OIF 2.